On the Worldwide Day of Solidarity and Support for the ejidatarios of San Sebastian Bachajón in their struggle against dispossession, the Adherents to the Sixth from Barcelona will be offering an exhibition and some videos in premises provided to us by the Local Federation of the CGT from Barcelona. We will provide information about the expropriation of lands and natural resources that the bad Mexican Government intends to carry out and the imposition of its megaprojects of plunder and death for the originary peoples. First report on the Week of Worldwide action in solidarity with the the ejidatarios of San Sebastián Bachajón, to be held from 4th to 10th December, 2016. Compas, we are pleased to announce that plans are going well for the Week of Worldwide action in solidarity with the the ejidatarios of San Sebastián Bachajón, from Sunday 4th to Saturday 10th December, 2016, International Human Rights Day. The event has the full support of the compas of la Sexta Bachajón including Domingo Pérez Álvaro and the family of Juan Vázquez Guzmán. So far, compas from the following countries have confirmed their participation: Canada, England, Spain, Mexico, Germany, Peru, United States, Uruguay. We send you all warm greetings and embraces of solidarity from Canada, England, Mexico, Peru, the United States and Uruguay. We, Hermann Bellinghausen, Hugo Blanco, Circulo de las Primeras Naciones de l’UQAM, Gustavo Esteva, John Gibler, Dorset Chiapas Solidarity Group, Malu Huacúja del Toro, Sylvia Marcos, Movement for Justice in el Barrio, Jean Robert and Raúl Zibechi, wish to share with you a humble proposal and hope that you will wish to join with us from your own places and in your own ways to carry out the Week of Worldwide Action in solidarity with the Ejido San Sebastián Bachajón from Sunday, 4th December to Saturday, 10th December, Human Rights Day 2016. This initiative is supported by the adherents to the Sixth from San Sebastián Bachajón. The indigenous Tseltal communities of the ejido San Sebastián Bachajón, like so many originary peoples throughout the world, are under attack from the forces of capitalism and transnational corporations who will not rest until they have destroyed the entire planet with their megaprojects of death. In San Sebastián Bachajón, the greed of governments and businesses covets the ownership of the beautiful waterfalls of Agua Azul, in order to construct an elite tourist destination. The ejidatarios of San Sebastián Bachajón are obstacles to their plans and their profit, as they inherited the lands from their ancestors and care for them as a great treasure of humanity. For this reason, they have been recipients of threats, aggressions, arbitrary detentions, forced disappearances, imprisonment, torture, and attacks from state forces and paramilitary groups. On 17th October 2016, a brutal attack took place against the tireless community organiser and human rights defender from La Sexta Bachajón, the indigenous Tseltal Domingo Pérez Alvaro. He was detained for three hours before being savagely beaten and threatened with death by the group of supporters of the official Ejidal Commissioner of San Sebastian Bachajón, Manuel Guzman Alvaro, who left him gravely injured and unable to speak. It is time to raise our hands, words and voices in solidarity with the adherents to the Sixth Declaration from the ejido of San Sebastián Bachajón who are an inspiration to us all in their dignified struggle, and who are currently experiencing serious acts of violence and police and military occupation, along with eviction, deceit and plunder, in the continuing attempt to dispossess them of their ancestral lands and sacred places. These recent threats and acts of brutal aggression compel us to offer our solidarity. 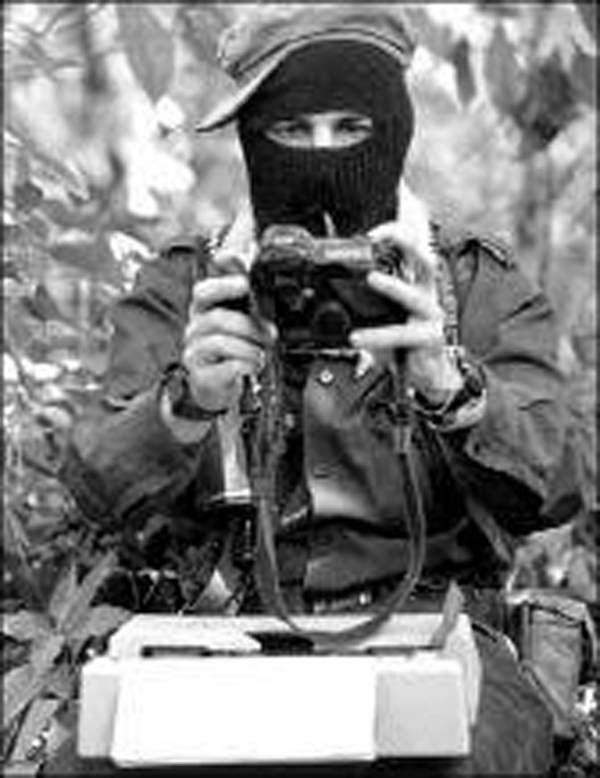 As a direct result of the determination of the ejidatarios of San Sebastián Bachajón to defend their lands, their beloved community leader and spokesperson Juan Vázquez Guzmán was savagely assassinated with high velocity firearms on 24th April, 2013 and community organiser Juan Carlos Gómez Silvano was murdered with over 20 gunshots on 20th March 2014. Domingo Pérez Álvaro is now being threatened with a similar fate. We demand an end to the killings, attacks and threats of violence! As part of the bad government’s policy three compañeros from San Sebastián Bachajón are now in prison. Over 150 people have been imprisoned since 2007. We demand freedom for the unjustly imprisoned Esteban Gómez Jiménez, Santiago Moreno Pérez and Emilio Jiménez Gómez! The bad governments and their allies in multinational business corporations wish to destroy the indigenous peoples and all those who struggle from below and to the left, because it is only the organized resistance of autonomous communities against their wars and the destruction of our natural resources that can save the Mother Earth for our children. For this reason, we call on you all to join together to continue the dignified struggle of the ejidatarios of San Sebastián Bachajón, so that all ways and forms of life may have their place. In honour of all the work in the defence of human rights undertaken by Domingo Pérez Álvaro, let us raise our voices on World Human Rights Day, 10th December 2016, in solidarity with our compañer@s from La Sexta Bachajón. We therefore call on all who strive to build another, better, world, one of freedom, justice, democracy and dignity, to join our forces together to organize activities –from your own area and according to your different methods of struggle- to carry out the Week of Worldwide Action in support of the Ejido San Sebastián Bachajón from Sunday, 4th December to Saturday, 10 December, 2016. We ask you to please let us know as soon as possible if you are able to accept our proposal and if you will participate. Resistance is Life! Dispossession is Death! Freedom and Justice for Esteban Gómez Jiménez imprisoned in Cintalapa de Figueroa, and for Santiago Moreno Pérez and Emilio Jiménez Gómez, prisoners in Playas de Catazaja! The Sexta Bachajón send a videomessage in support of the Week of Worldwide action in solidarity with the the ejidatarios of San Sebastián Bachajón, from 4th to 10th December, 2016. The compas of La Sexta Bachajón, including Domingo Pérez Álvaro, have made the following video message in support of the Week of Worldwide Action in Solidarity with the Ejido San Sebastián Bachajón, to be held from Sunday 4th to Saturday 10th December, 2016, International Human Rights Day. In the message, Julian, the brother of the murdered social activist and beloved community leader Juan Vázquez Guzmán, expresses the community’s thanks and support for the initiative. Ejidatarios of San Sebastián Bachajón, adherents to the Sixth Declaration of the Lacandon Jungle and participants in the CNI, reported a fierce attack against Domingo Pérez Álvaro, who is now in delicate condition. According to a communiqué from the ejidatarios, on Monday 17 October, at approximately 4 pm, people belonging to the group of the officialist ejidal commission, who are pro-government and against the struggle being carried out by the ejidatarios for land, detained and assaulted Domingo Pérez at the top of Alan Sajcun when he was on his way home. Domingo Pérez, an indigenous Tseltal, was imprisoned for five months, along with other ejidatarios, in 2011 in the prison CERESO 17 at Playas de Catazajá on false charges and multiple violations of their human rights, for his actions in defence of the land. On the day of the attack, Domingo was returning from the same prison, where he went to visit another political prisoner from Bachajón, Santiago Moreno Pérez, on behalf of the organization. According to the statement, the people of the ejido accused Domingo Pérez of participating in collective works on lands of the neighbouring community of Bolom Ajaw and of participating in la Sexta Bachajón. Indeed, Domingo has participated in la Sexta Bachajón since its founding, acting as a promoter of human rights and participating in the National Indigenous Congress. “We hereby inform you that today at about 4 pm a group of people, followers of the officialist Ejidal Commissioner of San Sebastian Bachajon, Manuel Guzman Alvaro, arrested and physically assaulted compañero Domingo Pérez Álvaro, when he was at the top of the crossroads of Alan Sajcun travelling towards his home after performing work for the organization visiting compañero prisoner Santiago Perez Moreno at CERSS 17, Playas de Catazaja, Chiapas. Compañero Domingo Pérez Álvaro is in a delicate condition after receiving strong blows from the people of the ejido, who claim he allegedly participated in collective work in the lands of Bolom Ajaw and participated in La Sexta Bachajón. Comrade Domingo Pérez Álvaro participated ever since the founding of La Sexta Bachajon; he has walked in promoting human rights and participates in the National Indigenous Congress, he also participated in the 20th anniversary of the CNI. We give this urgent word to let you know and to ask for your support through the dissemination of information. We condemn the actions of the ejidal commissioner Manuel Guzman Alvaro who we hold responsible for the integrity of our colleague Domingo Pérez Álvaro and for any attack that may take place on the compañeros of La Sexta Bachajon. We ask you to remain alert for more information we will publish. We reject their acts of dispossession which only serve to confirm their agreements with the bad government to deliver ejido lands to them. Compañeros y compañeras, we hope you all have a good day. In this message we send you our communiqué asking you to please give it wider dissemination. We are currently in a peaceful action at Crucero Chabán, on the section of the highway from Ocosingo to Palenque, to demand truth and justice for the disappearance of the 43 students. FROM THE EJIDO SAN SEBASTIAN BACHAJON, ADHERENTS TO THE SIXTH DECLARATION OF THE LACANDON JUNGLE, CHIAPAS, MEXICO, 26TH SEPTEMBER, 2016. Jmololabex ants winiketik icha spatil to wotanik ta pisilik machatik nokol skoltabel you kinalik you yuun ta lum skuenta nokol you spojbel you chopol ajwalil. Comrades in general we wish you all a good day, receive a warm greeting from the adherents to the Sixth Declaration of the ejido San Sebastián Bachajón. Today marks two years since the barbaric repression in Iguala committed by the Mexican state, also killing three people and leaving three others in a coma due to the repression suffered, at the same time leaving 43 young normal school student teachers disappeared, so far they have not been given justice. These figures are added to thousands of killed and disappeared throughout the country as well as hundreds of political prisoners incarcerated for their commitment to the defence of the peoples and of life, because we are tired of our natural resources being exploited, the bad government sends our compañeros to prison for defending our mother earth, for organising themselves, that was the crime they committed, when all we want is that our rights are respected, and our natural resources. For the results implemented by the Mexican narco-state against the people, to impose their projects of plunder and territorial destruction by large private multinational companies, have been accompanied by the constitution, since the bad government with its reforms has privatized what corresponds to society, violating our rights as indigenous people, as they want to put an end to our struggle to achieve their ends. We join the national and worldwide clamour; we open our hearts to the rage and pain of the parents of our young disappeared compañeros, we protest against the bad government, we will continue in the demand for the live appearance of the missing students from Ayotzinapa. We tell them they are not alone, their struggle in the demand for justice is ours. No more unjust imprisonments, we demand the immediate release of our compañeros unjustly imprisoned, Esteban Gómez Jiménez imprisoned in Cintalapa de Figueroa, Chiapas (amate # 14) Santiago Moreno Perez and Emilio Jimenez Gomez, prisoners in Playas de Catazajá, Chiapas (ceress # 17) who were imprisoned for having the commitment to fight and defend mother earth; we also demand the freedom of other political prisoners of Mexico and the world. Long live the dignified struggle of the comrades of San Francisco Xochicuautla!